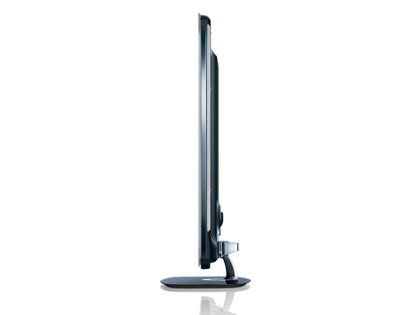 The 40PFL8605H marks Philips’ first foray in to the UK 3D full HD television market. The TV it has chosen to lead the charge is a 40″ LED display equipped piece of kit, which also shows off Philips’ Ambilight Spectra 2 technology. To just get all the basics covered, the 40PFL8605H uses ‘active technology’ to create the 3D illusion so you may need deep pockets depending on how many pairs of active shutter glasses you’ll need to purchase. The actual physical appearance of the television is quite suave and sophisticated, in true Philips style. It is also extremely thin, thanks to the LED edge lighting technology in use on this panel. 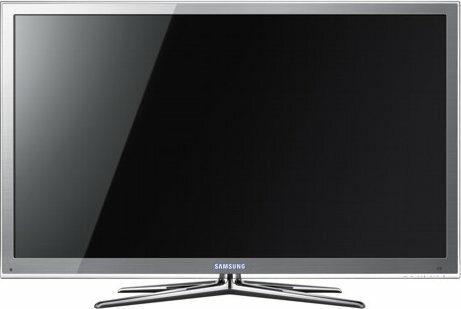 On the subject of lighting, being a Philips 3D HD TV, it also features Ambilight technology, meaning light is thrown out of the rear sides of the television to help focus your attention on the actual picture. People are divided on the use of Ambilight so if you haven’t seen a set with it before it’s best you pop down the High Street and have a look for yourself. The other part of the design which you should be aware of is the rather reflective nature of the screen, due to the fact a large lump of glass has been placed over the panel. If you position your TV near a window or next to some particularly fierce lighting, then you may want to consider moving it otherwise you will be living in reflection city! Before we go on to the performance of the Philips 40PFL8605H, let’s just have a quick look around the back and see how the connectivity and features stack up. As you can see, 4 HDMI ports and a host of multimedia connectivity catch the eye, with a DSUB, Ethernet, USB and couple of card reading slots. The TV can be hooked up to the Internet via it’s network connection and actually has a built-in Opera web browser to enable some basic surfing. You can also use this port to stream content from a DLNA compatible PC, or use the USB and card readers to do similar. 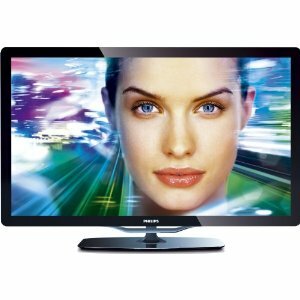 Now, at heart, this is just a normal 200Hz processing LED LCD HD TV that uses Philips’ Pixel Perfect image processing. What turns it in to a 3D TV, is the addition of a plug-in transmitter and the two receiving sets of active-shutter glasses. Yep, you only get two pairs I’m afraid. And so, donning your glasses, it’s time for some slight disappointment…..
…OK, it’s not the best 3D experience in the world. There is noticeable ghosting, which seems quite prevalent in 3D LCD TVs as opposed to the plasma ones, but what you do get is a bright and sharp picture which is full of glorious HD detail. In fact, just using the set to watch 2D HD or SD content, will have you loving it again as the picture quality, colours, brightness and detail or all very good, especially if you tinker with all the image processing and pre-set viewing modes. Just as with any image processing, you’ll need to find a happy medium between too much and too little to produce as natural and free-flowing image as possible, but once you do, you’ll be over the moon. For, as the 3D pack seems to be an add-on, so does watching 3D on the Philips 40PFL8605H. Stick with 2D and it’s one of the best pictures you’ll see, once tweaked, so it’s only when 3D gets involved that the quality dims a little. But, if you’re in the market for a new HD TV and think you might want to give 3D a try, rather than live solely for 3D content, it’s worth looking at because as an HD TV it’s a good bit of kit. As always, get yourself down to a showroom and see for yourself before deciding.